Well, after an attempt at repairing the old Atomic 4, and several attempts to learn the complexities of a gasoline engine system, we (by the way I should mention that "we" refers primarily to me, John Wilson, and my Dad, Ian Wilson as we've bought the boat together) gave up and made the decision to switch to electric. I should mention that this seems a little less crazy to me than perhaps most people as I live in a "eco" house that has grass growing on the roof (free air conditioner), solar panels covering the south side (earning me big profits on theOntario MicroFIT program that pays 80.2 cents per kilowatt hour), a wind turbine, and some ten year old deep cycle batteries in the basement. We actually generate more electricity than we consume in the house and it seemed to me we ought to be able to make the switch to electric on the boat for the hour or two max that we ever use the motor going in and out of the dock. So, after a quick google search we found Electric Yacht ( http://www.electricyacht.com ), run by Bill and Scott down in the Minnesota, in the United States. A run through their conversion stories and YouTube videos convinced me that we could do this. If a guy in Malaysia can order the system, get it hooked up and say it works well, then surely we could do this. So, we talked to a few boat mechanics, most of whom were less than interested, and then found Lorne at Genco who is young and eager to try to make this kind of new challenge work. So, we ordered the 10 kW brushless electric motor (sized by Bill and Scott based on some of the boats dimensions). The electric motor system, which we were assured is flexible enough to fit in the same location and mount where the Atomic was, came with everything we need including a monitor system (percent charge remaining, volts, amps, rpms etc), a throttle, power controller and the motor. The only other parts we needed to buy were some deep cycle batteries, heavy gauge wire and a charge controller for the deep cycle batteries. So, we all did some research and then went with the Odyssey batteries that Bill and Scott recommended combined with an Analytic charge controller that Lorne thought would suit our needs the best (military grade, sealed to prevent getting wet). The four large, rack mountable Odyssey batteries we ordered each cost about $700 and weighed in at about 130 pounds each. When all the new components, motor, and battery were combined we figure it weighs about the same as the Atomic 4 with a full tank of gas. All the new equipment including batteries would also fit nicely where the old motor and gas tank were removed retaining the same weight and balance in the boat. Once everything had arrived Lorne followed the installation manual, and made a few calls to Bill and Scott, to get everything wired up, aligned and ready. Lorne had to design a solid wooden box system to hold the batteries in place. We cleaned out all of the old gasoline and oil gunk and painted the engine compartment white before putting the electric in. Finally the big day had arrived and we took her out (Initram is the name of our C&C sailboat) for a trial run. All systems worked flawlessly...better than expected. Simply push backward and she reverses out of her slip, quietly, with the simple hum of the electric motor. Out on the water in forward we take her slowly up to 2000 rpm. We get up to about 5 knots and all systems are looking great. Around the Toronto Harbour we motor, enjoying the ability to talk to each other as we move around (so nice not to be yelling over the sound of the gasoline engine). At about 80% of the rpm max the Electric Yacht control monitor system says we've got about six hours of run time. At full throttle the system suggests we have about two hours of run time. We've now been out many times and always seem to come back with essentially 100% charge remaining. For most of our sailing we take her out of the slip and once out in the harbour we put the sails up. Same thing coming back in so we had not really used much of the juice in the batteries on any outing. Finally, we decided to make a more substantial trip, going from Toronto to Port Credit. On this day we had some strong winds out of the north. We motored for about twenty minutes across the harbour to pick some people up. We then motored for another ten minutes in the harbour putting the sails up. Off to Port Credit we sailed. We enjoyed some good sailing speeds up to 9 knots while riding some big ten foot waves. Once we'd arrived in Port Credit (my first time sailing to a destination and my first time going to Port Credit), we were unlucky enough to have to surf in on those big breakers (or lucky depending on your perspective). The adrenaline was pumping as we rode a big one in and behind the break wall. Once fairly close to the wall, in the deeper part of the port I thought we were safe. Not on this day. The waves were still going up and down about six feet from top of the crest to the bottom of the wave. As we thought we were getting close to the public docks we were startled to realize we had become stuck on the bottom as we dropped down in the trough of a wave. As the next wave raised us up we were able to move again but this was not good. I immediately began to worry about the new motor and how the heck we were ever going to get out of this mess. Reverse, someone said. Yes, don't fight it, let us back our way out of here. Full reverse on the new electric. Two thousand rpm...and nothing. Then a wave picked us up a bit and we started moving backwards. The next wave the same thing. Finally on the third wave I was able to have full control of the boat in reverse, full power. So I kept her on full throttle for about five minutes taking us back into the bigger waves wondering all the time, would she have enough power to keep us out of the break wall. She did and then some. We got tucked in behind Port Credit Marina break wall and finally I switched her back to full forward going to the right into the Port Credit Marina. We found an open slip and took about half an hour to catch our breath and come down from the thirty minute adrenaline rush. Now it was time to get back on the horse and get back out into those big waves. We'd used a lot more power from the batteries than I had ever expected to. Still, the monitor still indicated we had about 90% remaining battery power. So, we put the nose back into the big waves and started motoring back into those waves. Would she have enough power to make way against those waves and the strong wind coming against us? She sure did. We made some good progress out into the lake and got the sails up going directly into those ten foot waves and a heavy 20+ knot wind. Approaching Toronto we decided to motor through the western gap and across the harbour instead of sailing for another hour or so to get to the eastern gap where the QCYC entrance is as the sun was starting to set. We motored through the western gap and across the harbour as the sun set at about 80% power, moving nicely at around 4 knots. We had about 69% battery remaining when we got back to the dock. We packed everything away and I plugged in the batteries so they'd be ready for another fun filled day of sailing. 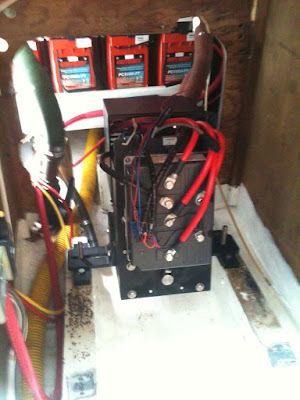 Electric motors for sailboats have arrived. Just think how much sense it makes. A gasoline engine has an electric motor, batteries for that starter electric motor, spark plugs, pumps, cooling systems, and who knows what else. With electrics, you are down to one of those basic systems...a large version of the gasolines electric starter motor. Talk about making things easier and simple to understand, never mind reliable. Add to that the ease of maintenance, ease of fueling (just plug her in), and ease of use. The more time we spend with the electric the more I have no doubt that this is the future of boating.